Sea-buckthorn is not easily confused with other wild plants on this web site. 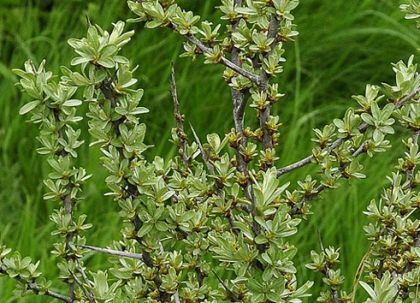 A deciduous shrub or small tree, Sea-buckthorn is dense and thorny. Although usually only 1 or 2 metres tall, it can reach to 10 metres. It has absolutely tiny, green, petalless flowers each having 4 stamens and a 2-lobed calyx. They bloom in March and April, the male and female flowers appearing on separate bushes. 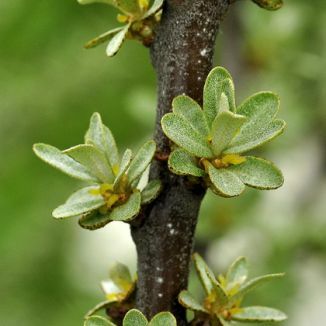 The leaves are narrow, lanceolate and alternate and are covered with tiny silvery scales giving them a greyish appearance. The bush has stout spines and in autumn bright orange-yellow berries (7mm across) are borne on the female plants. This is a plant of sea-shores and cliffs, is not a native plant here – it originated in China - and it belongs to the family Elaeagnaceae. I first identified this plant in 1976 at Kilcoole, Co Wicklow and I photographed it in April 2009 on the North Bull Island, Co Dublin. 'The Sea Buckthorn (sic) has been planted in many places through the network of small carrot and parsnip plots which covers a large area of the landward side of the Rush* sandhills. Here its far-creeping roots serve as a binder of the sandy shelter dikes as it does of the shifting sand bluffs by the coast-guard station, and from these centres of distribution the plant will doubtless in time spread widely over the uncultivated part of the dunes. As a result of the storms, the roots of several mature plants were found laid bare along the sea face of the dunes here in 1902. Some of these roots, belonging to plants only 3 feet high, were found to measure fully sixteen feet in length. *Rush is in north Co. Dublin. The berries are important winter feeding for some birds such as the Fieldfare. They are also commercially used in Asian medicine and find their way into Western skin preparations and sunscreen products, the oil of these berries reputedly providing effective relief from burns, dermatitis and skin ulcers.